32" Bristle Diameter: Provides for long service life. Choice of poly or wire or combination poly/wire bristles: Allows owner/operators to meet operational needs. Wire or poly/wire combinations provide more wear life and more aggressive sweeping action. Faceted hood design: Provides for a higher level of overall structural integrity. Easily removable brush drive: Allows for quick and easy change out of brushes without motor removal or opening hydraulic lines. Choice of manual or hydraulic angling: Allows owner/operators to meet budgetary and operational needs. High or regular flow hydraulic options are offered to ensure that cylinder travel response is safe and appropriately matched to output flow of the tractor. Brush angles 30 degrees to the left or right: Provides for excellent material control and puts sweepings where the operator wants them. 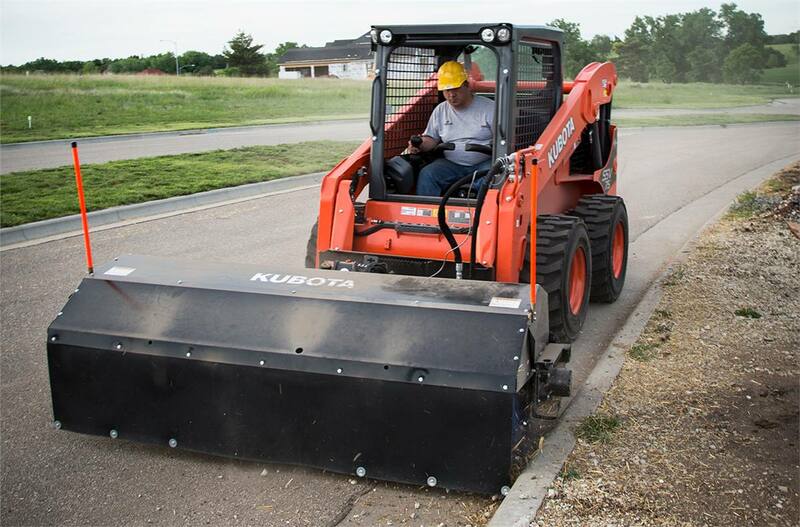 Compatible with 12GPM to 25GPM hydraulic flow at 2,000 psi: Allows attachment to a wide range of skid steers and compatible compact utility tractors equipped with loader arms and skid steer adapter plates. Integral flow control valve: Protects hydraulic system and motor from hydraulic inputs exceeding 25 GPM. Integral float control design: Spring loaded adjustable down pressure control and stops prevent premature brush wear while providing appropriate surface contact with the rotary brush. 100 to 230 rpm brush rotation: Provides for good sweeping action and material control. Integral storage stands: Enables easy dismount and storage and keeps bristle ends from becoming deformed by supporting weight of the unit. Rubber Dust Deflector Flap (optional): Helps keep dust levels under control and down and under the hood cowling and out of the operators field of vision. 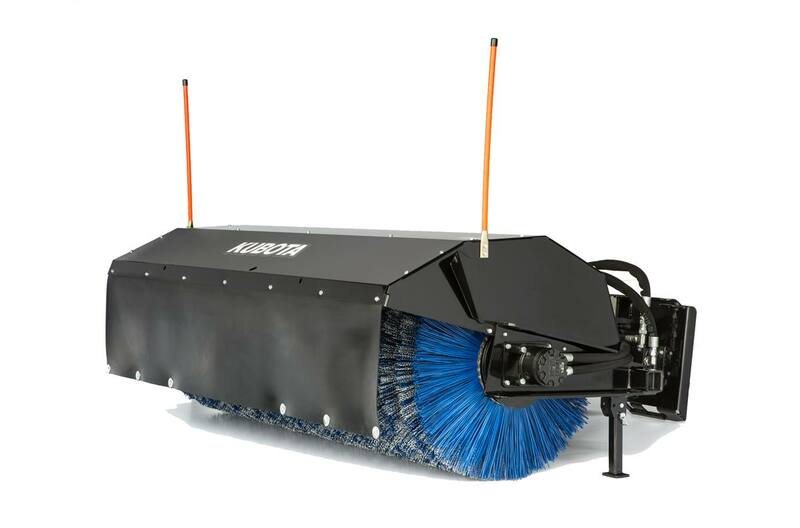 Dust Suppression system (optional): Hood mounted spray boom and nozzles dispense a fine spray mist in front of the broom to control and minimize airborne dust particles. Metal Shroud Extension (optional): Extends the broom shroud further forward to help control dust. Spray nozzles can be mounted on the extension to help minimize airborne dust particles. Marker Indicators (optional): Aids operator in knowing exact position of extreme left and right edges of the unit for safer and unencumbered operation. Available in 72" & 84" Working widths: Provides for excellent productivity and ideal sizes for most skid steers and compact utility tractors. Weight w/ high flow set-up, hydraulic angling jack & combination broom: 854 lbs. Sweeping Width @ 30o Max Angle: 65"